Vincent Laforet says there's plenty of blue sky above - and the possibilities are endless. 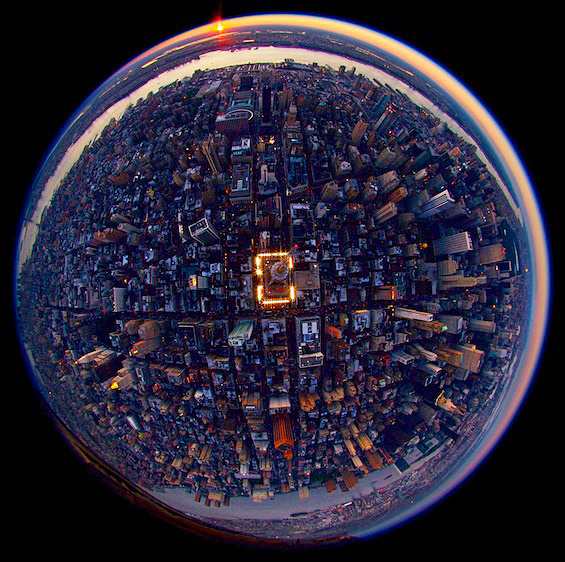 A circular fisheye lens captures a river to river view of the Manhattan skyline. This past year has been one of the roughest years for the newspaper and magazine industry --- and truth be told --- the outlook for the next few years looks even grimmer. It seems that there isn't a day that goes by without reports of a newspaper chain cutting dozens or even hundreds of jobs, circulation and general public interest in the mainstream media dissipating, and advertisers slashing their spending as well. Then there's the constant threat to our livelihood by those wanting to work for "free" or in exchange for "access" or to get "published" and clients expecting that dangling such carrots are enough to entice us to work for "free". With the explosion of digital cameras and easy ways to easily e-mail/transmit photographs (at the perceived near zero cost other than the initial investment in equipment, which is later realized to be a falsehood) the market is now and forever changed. While everyone in the media business is feeling the effects - photojournalism and those that practice the craft seem to have a target painted on their backs for a number of reasons - and these trends are something we should all be paying very close attention to - the survival of our medium depends on our ability to stay ahead of the curve in these times of rapid and unforgiving change. One could legitimately ask: is the sky falling? Short answer: I don't think so - but I do think the cloud is falling. What do I mean by the "cloud?" I'm talking about that cushy comfort zone and business model we have all become accustomed to: the idea of a staff job with benefits and company gear, the idea that if we follow the traditional career paths of our predecessors we too will find long term financial security, the idea that if we do things the same way that we've always done them, or are being taught to do them at schools/universities - we'll be "OK."
The truth is - our way of doing things - not only the way we gather our content, but also the way we package, deliver and the way we expect to be remunerated for that work - is being shattered by a variety of internal and external forces that simply aren't going to go away. And the reason that I'm using the analogy of the "cloud" - is to point out that as frightening as some of these prospects are, clouds always obscure the blue sky above - our industry is not dying - it's evolving - and there's no reason to run around in a panic... many of us will survive...and many of us will be forced to work in an entirely different field. If we pull back a little and focus more on the big picture and look at the overall state of the economy as well as the way people are using the internet to both obtain their news and exchange ideas with blogs and websites - one can see a truly perfect storm forming. One that bodes particularly poorly for both the giant media companies as well as for photographers in particular. First - we're entering a recession - or whatever you decide to call it. Possibly a big one, one that might last anywhere from 1-3 years - and one that is going to affect not only the U.S. but also most of the global economy. There are a number of factors of course behind this that I won't get into. But I'll take one of the obvious factors to illustrate how one change can affect the entire system: As everyone knows, the cost of oil/fuel is at a record high. This is affecting the overall market pretty sharply, not only is it affecting the stock market (which drives everything) but also obviously operating costs for the airlines and trucking companies. This in turn affects the cost of shipping, which then affects the cost of produce/goods which hits us in our pocket books, which has us driving less and spending less on cars, vacations, and everything else - which in turn affects retailers, airlines, service industries … and on and on and on. Everything is related - it's a big ecosystem - and in this case it's a vicious circle. If you study the stock market and individual stocks/companies, you'll have a much better understanding of what makes this entire world tick, not to mention the large media companies. We're living in a time where more than ever - every decision that is made seems to be somehow related to the bottom line. It's all about increasing or at the very least maintaining profit margins quarter to quarter. Corporations have one focus: avoid cutting into those profit margins at all costs, eliminate jobs and make as many cutbacks as you need to insure those margins don't diminish. All too often they seem to focus on the next quarter's result and short-term guidance - at times one wonders if they're doing so at the expense of the long-term health/value of the company. Capitalism is all about trimming the fat and growth. What is of particular worry for us is: as (both media and non-media) companies have to cut back to maintain their margins and to adjust for all of the rising costs, one of the first areas that they usually cut back is in advertising. It's easier for them to run fewer ads, or spend less producing them - than it is to fire people. And that's a big problem for the media companies out there because their main source of income (for the most part) is advertising. The $.50 you pay for the newspaper really only subsidizes the delivery and cost of the paper it's printed on after all (not the salaries and expenses for the staff producing it) almost all of that money comes from selling ads in the paper or magazine. This means that the media companies in turn aren't selling as many ads and therefore they have to make cuts of their own. First budgets are slashed; there is less of, or in many instances no budget for travel or special projects/content. The next step is eliminating full time positions --- even freelancers --- anything to continue to cut costs. Often the most experienced staffers who have a wealth of contacts/experience/knowledge are the ones that are let go because they are paid the most due to their seniority/merit raises. The problem becomes compounded, with fewer people and less original content, the quantity and quality of the product they produce tends to decrease, giving the reader even more of a reason to stop buying that product, one that they can already read online for free btw - which further cuts circulation, subscription revenue, and more importantly what the publication can charge the advertisers, fewer people buy the publication= fewer eyeballs = less value to the advertisers in buying ads= less that the newspapers can charge for the ad space they have. As you can see, like the overall economy, the media industry is being sent into a vicious downward spiral - and in an effort to slow the bloodletting, many are amputating one of the legs they stand on: quality content. 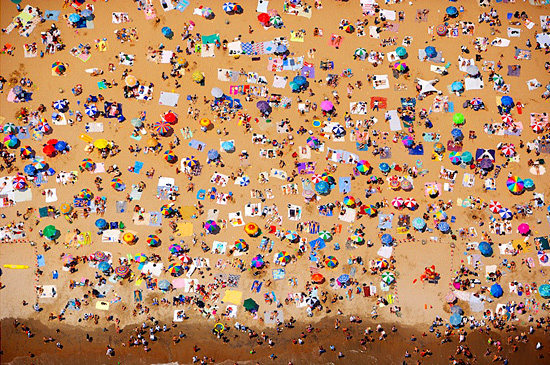 Beachgoers populate the public beach on Coney Island in Brooklyn, NY. What adds to the furor with this recession as opposed to ones the industry has faced in the past is the fact that the public at large DOES have alternatives. There is now more content than ever before online, more television channels, and it's easier and cheaper to publish and share content on the web than ever before, and in fact the vast majority of it is available for free. Not only is it available for free - people expect to get it for free. Just recently the Associated Press came under attack by members of the blogosphere when they dared to set standards about how their content could be used/attributed. The other good sign of progress is that software such as iTunes and devices such as iPods, iPhones and AppleTVs have made it so simple to access these songs that many more of us are opting to pay the $0.99 or more to download the song (as opposed to stealing it.) The point is there are a lot of parallels between what happened to the music industry in the past decade and what the major media companies are going through now. There are two main problems that the big media companies are facing in this evolution: first they are slow to convert their traditional content to the internet - often they're just slow in making the switch (think: slow like molasses,) they aren't sure exactly how to deliver it (in what form, format etc.) and just aren't hip or as innovative as bloggers, or smaller more modern startup content providers. Second they just can't seem to find a way to make money online - for two reasons: again most users "expect" to get content for free nowadays, and second, the internet advertising model is still in it's infancy. Sure there is a lot of money to be made with advertising on the internet, but as of now advertisers are paying significantly less for online advertising than they did for television/print advertising, not to mention that pop up ads and banners are far from what one would describe as sophisticated advertising methods - they're mostly annoying... I've sold quite a few of my images to companies for advertising use online - the rates tend to be 1/3 to 1/4 of what print ads pay... why so? Doesn't make much sense to me - and I write it off as the inefficiency in the model right now - that will correct itself over time (hopefully!) After all GM announced this year that they were shifting half of their $3 Billion advertising budget to online advertising --- that's $1.5 Billion dollars going to advertising on the web! Also of note: The New York Times Company reported at 13.2 percent decline in ad revenue in May compared to last year. Good news: The NYT Co. says Internet advertising is up 14.2 percent. Problem is 10% down for the newspaper doesn't come close to being evened out by 10% of web revenue...yet. One of the other challenges big media companies face is that they're run by people in their 50s and 60s - who just really aren't hip to the current trends, and the internet - relative to the 12-30 year olds that are fueling the growth and evolution of the web, not to mention overall trends. Put plainly: They're working at it really hard - but they just don't get it most of the time and who can blame them? At the age of 33 I sometimes feel like I'm simply not able to keep up with the latest trends - I sometimes fee "old" or "behind the curve" if you will - strange given that I started to play with computers before I ever picked up a camera. To me, it seems like too many of newspaper and magazines' brass are running around like chickens with their heads cut off as a result - chasing around page view results and reader surveys blindly - allowing the readers to determine what they should be covering (Paris Hilton, Britney Spears etc.) as opposed to the content that they are familiar with. One newspaper in Texas recently hired a full-time videographer - to do nothing but chase ambulances - because that section that shows pictures of accidents gets the most hits on their site... Dummy down the content - and suddenly you're not much different than Joe Bloe's Blog ... are you? At times media companies seem to be their own worst enemies - ensuring their own demise - that is perhaps the most frustrating and demoralizing thing to witness. Most journalists and photographers are quite aware that this is happening - the question is whether or not many of these managers could possibly be this clueless, or if in fact they are just as aware of it as we are, but haven't found a solution to meet many of these new challenges, and are just looking to find short-term fixes that will allow them to at least reach their own retirement within a few years' time - regardless of what they leave behind. 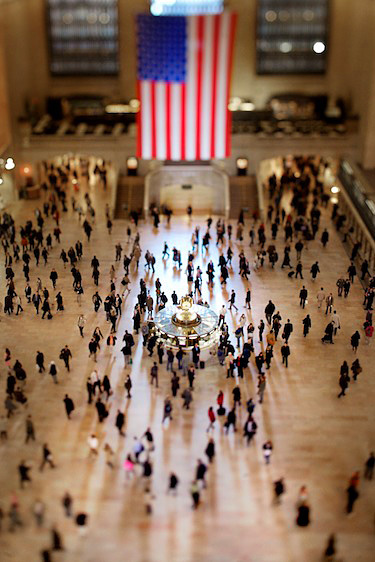 Early morning light fills the lobby of the Grand Central Terminal while commuters shuffle about, in Midtown Manhattan. The second responsible question is: could we do any better if we were in their shoes? After all the solution is to in many ways "re-invent" the wheel or business model - not just find a quick series of fixes. Sadly - too many us of are too transfixed with our own survival to realize that we should instead be focusing on working together to solve these problems and find new solutions. So what about photography? Photojournalism is dead right? If and when the printed newspaper/magazine vanishes we're done with too right? Photography will always be around in my opinion - but not to the same degree it is now. As newspaper and magazines disappear - so will a lot of the photography - forever. The truth is that while photography is one of the most popular hobbies and growth sectors out there - most people seem to want a richer media experience on the web. Still photographs will always be around - we will see a slide show on a website 10-20 years from now - but it will likely incorporate video, sound and a variety of other artistic media into something we just haven't quite seen yet. However I don't think that still photographs will continue to dominate the front page of the New York Times or any online publication - those days in my opinion are clearly numbered. The same goes for advertising by the way - still images ads won't be around for long either - the last advertising job I did involved a complex flash site with multiple moving images, that was completely interactive with the user, and that integrated video within the still images that I shot... it's already begun. Most of them don't know what they're doing (they can of course learn and get better - with time) but there's obviously a tremendous amount of learning to be done - shooting video and editing it are both art forms in their own right - how many videographers do you know who could pick up a still camera and produce a cohesive photo essay... not too many - and I see very few newspapers/magazines making any type of investment in teaching people / sending them to workshops on how to fine tune these skills. This is one of the two the big ones for me: there is already an entire industry doing this - it's called broadcast television. Broadcast videographers/editors/documentary filmmakers have been doing this for decades, have budgets that trump our budgets exponentially, have better equipment, satellite trucks, and huge staffs... isn't it a little arrogant to think that we can really compete with them??? Well - truth be told - just as blogs can be a threat to major newspapers, I think that if the multimedia content newspaper photographers produce can in time be a threat: IF THE QUALITY is there - and I'm not talking production quality: but the quality of the content - with today's software, and wireless cards - suddenly you don't absolutely have to have a satellite truck...do you? It's an uphill battle though in my opinion. But it'll only work if the quality is there - otherwise it will be a total flop. There are just too many alternate high quality sources out there for someone to want to watch a bad video on xnewsaper.com's site. Lastly - the second big one, and this is one thing that will truly affect sports photographer first: no one is going to allow newspaper and magazine (or web) videographers to continue to access organized events (that are not on a public street for example) for free - not when television is paying for rights to these events. If NBC is paying $900 million dollars to televise the Olympics in Beijing to the U.S. - there is no chance that they are going to allow a Dallas Morning news photographer, for example, to show video of that event on their websites for free. The Dallas morning news and all other media outlets will have to pay for broadcasting rights just like anyone else - and that's something newspapers and magazines are completely unprepared for and simply don't have a budget for. This issue will come to a head as video becomes more prevalent within newspaper/magazine websites. I'm sad to say that as a result every sports photographer should begin to start counting their days of access to major sporting events - leagues are already trying to regulate how many pictures we can put up on our websites, when we can put them up, and how long we can put them up. Many of us are saying that Beijing will be the last Summer Olympics we ever get to cover for example - this may be a bit extreme - but I've heard it from a few of the top sports photographers in the business - names you all know. 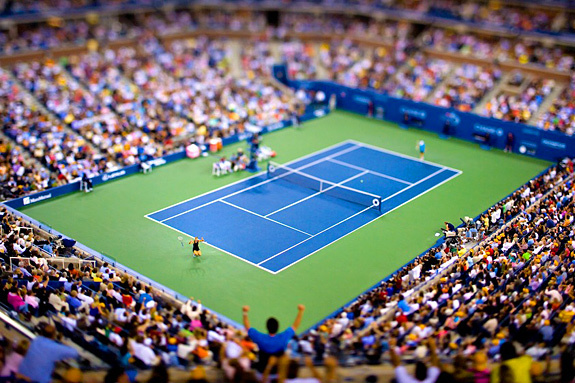 Maria Sharapova defeats Justine Henin-Hardenne 6-4, 6-4 to win the US Open in Arthur Ashe Stadium. With leagues such as the NBA hiring a huge staff of 15-18 photographers and a staff of 35 technicians (!!!) to cover the NBA Finals, and looking to put those images up on their site within minutes of the time they were shot (http://www.dailynews.com/sports/ci_9582832). It's only a matter of time before they start to tell non-paying media organizations (i.e. newspapers and magazines) that they are no longer going to issue any press credentials. Outside of the fact that many of our stadiums are built/subsidized with public funds - there is nothing stopping them from denying us access to their games. The leagues are a big business - with one intent: to make money. And they will jealously protect their franchise by making sure they control their image - and if that means that they have to hire their own photographers to make sure that the only photographs that come out of the NBA finals are positive - so be it. They sure don't seem to need "us" anymore - be honest. I've asked a few of my colleagues - even reporters the following question: haven't you felt 'unwelcome' recently at major sporting events - kind of like we're almost a nuisance to the people organizing the events? When you think of it they have to give us work spaces, eliminate dozens of very expensive stadium seats to give us shooting positions, chaperone us around, deal with credentials, put together press conferences (which they can't fully control) -wouldn't it just be simpler to give ESPN the exclusive access? After all - they're paying millions of dollars for the rights anyway... and they're in the entertainment business - not the news business! Their reporters are not nearly as inclined to snoop around looking for the next steroid scandal that could tarnish a league's legacy...right? Do they REALLY need newspaper coverage in the sports pages anyway? Is anyone really reading newspapers anymore anyway or looking at their sites? And wouldn't we rather the readers come to our NBA.com website anyway? Maybe we don't even need ESPN - maybe we can do it all ourselves and have our own channel... hmmmm...maybe someday - wait don't the leagues already have their own exclusive channels that you can subscribe to? One more thing to consider about the general photography market: supply vs. demand - our formula is WAY off kilter. Do you know that there are more than 20,000 graduates with degrees in photography released EACH year in the U.S. alone by colleges/universities? Contrast that to the negative 100 or so staff jobs opening up each year (that's a total guess on my part) and you do the math... The freelance market is becoming incredibly over saturated... and that worries me a LOT. Not only do we have the amateurs who want to work for free with their new D3s or Mark IIIs (I won't delve into this issue that - there's already more than enough material on the sportsshooter.com message board every SINGLE day it seems.) But as I mentioned earlier - advertisers are spending less, which means there are fewer ads being shot, and as a direct result fewer ad pages and fewer editorial pages to fill with original images, and therefore fewer assignments that need to be shot...and those that are shot are done with smaller budgets (not to mention that as ad rates lower the publications are forced to add more ad pages which further cuts down on editorial space) - so there's less room to push the envelope, and the quality will often suffer... so the freelance market is facing problematic times. Now you have 20,000 plus students entering the market each year, hundreds of former staffers now looking to freelance.... you get the picture. 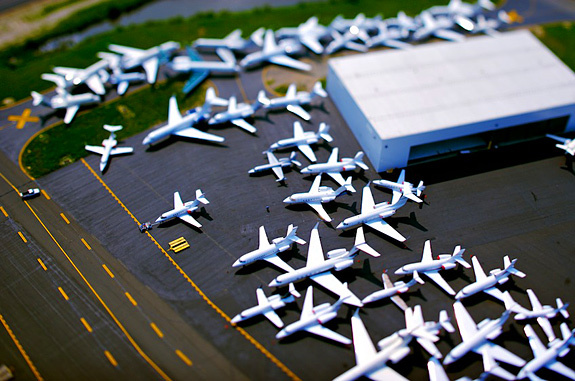 Dozens of private jets are embroiled in maze of congestion on one of the taxiways at Teterboro airport in NJ prior to the summer weekend. What worries me is that photographers who are purely editorial photographers - i.e. shoot only for newspapers/magazines and don't branch out into corporate and commercial work - are finding it close to impossible to prosper. When you add to the mix the horrendous contracts that many of the major publications chains put out - it makes it even more impossible to survive. It's always been an unspoken rule that while you won't make much money off of the magazine day rates - the access to the subjects they give you and the potential for resale of those images in the long run more than makes it worthwhile. Unfortunately the bean counters at those mags figured that out and are now insisting on long embargo periods (3-12 months!) and insisting that only they be allowed to re-sell the images during that time (and get a 50% cut or more during that period) that by the time the embargo is over - your chance of making secondary sales has been decimated. And that's if you're lucky. Most agencies or magazines try to buy you out of your rights out right if possible - they figure if they pay you a little more you'll take that and let go of any future sales - sales that they can then profit on 100% year after year, after year. And speaking of annual reports, that market is dying too. I recently shot the cover of a Goldman Sachs annual report for a big firm in Chicago called VSA Partners. A few weeks later I met the head of VSA partners while we were judging a design competition together, I told him how much I had enjoyed working on that job and that I'd love to work on others. He told me that the annual report market was coming to a precipitous end, apparently a law was recently passed that no longer requires companies to mail large annual reports to the thousands of their shareholders. This is an effort to save paper. As soon as that law went into effect, the annual report market in the US took a sharp nosedive. Now companies will likely shoot a dozen or so photographs for their websites and e-mail PDFs of their financial results. So we're in for a much, much tougher freelance market. And while there will be many more of us hunting for the scraps, my biggest fear is not the increase in competition, what frightens me the most is that historically photographers tend to be the first to undercut one another. More photographers will become desperate for work - and will be the first to accept jobs for less money or substantially reduced fees. This is of course a horrid vicious circle - just as with one's credibility, it's very easy to force market rates lower - almost impossible to bring them back up... it's already tough enough to make a living out there today with rates that haven't changed since the 80's - let's not help the media moguls by accepting to work for a lot less because we're desperate … PLEASE. That being said - I think that one has to pay attention to the market forces out there and to try to negotiate things out with clients, especially repeat clients. Chris Stanford was recently chastised on the message board when he was quoted in an AJC article: http://www.sportsshooter.com/message_display.html?tid=29756 --- stating that he had agreed to lower his rates for a repeat client due to the economic crunch. I thought the criticism was short sighted - while I respect having to stick to one's guns and trying to keep one's rates high if not working on increasing them of course - in certain economic times - you have to be malleable - or you will end up broke. Within reason of course - that's always the important point that seems to get missed on most message boards: finding a healthy balance is key - ultimatums seldom work in this type of market. One other thing that I have to say is: Thank God for wedding photographers! While that photography market will eventually become oversaturated due to the supply of all of these "unemployed" photographers, there's one thing for sure, people are still going to get married regardless of the economy and they'll always need photos (video just doesn't seem to work as well). I also love the fact that the "photojournalism" style is "in" with weddings today and that many photographers will likely be transitioning from their newspaper jobs to photographing weddings...it's not such a bad gig in the end - you book your jobs 3-24 months ahead, work mostly weekends, and get paid relatively well - you no longer need to fear the overbearing Yankee PR people who steal photo positions minutes before the big game, you need only fear the bridezillas! 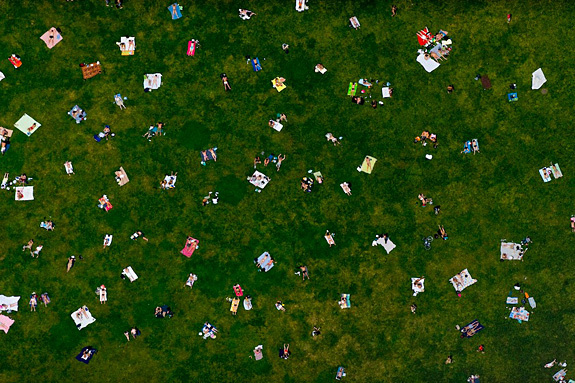 New Yorkers soak up the sun from Bryant Park just a block away from Times Square. So … will things work themselves out in the end? I hope so. While most newspapers and magazines will stop publishing physical copies at some point due to the rising cost of paper, delivery and declining readership (and more importantly the availability of the same content on their respective websites) many will find a way to survive online by continuing to produce quality content that (hopefully): a) People will either pay for b) They'll find a way to make web advertising become more profitable or c) Invent an entirely new business model. Photographers will have to think of themselves as visual storytellers - not just as still photographers. Photographers will becomes much more adept at producing multimedia content - not just boring slide shows w/ music - but ones that are truly engaging and original - basically they need to invent the next generation of storytelling - something we haven't seen before (i.e. they need to differentiate themselves from HBO Documentaries, and the other broadcast giants - not try to compete with them...) And this is key: Photographers need to brainstorm new ways to connect with their audiences and find new and original ways of generating income with these new "connections." Photographers need to be ACTIVELY involved in thinking up new ways of generating income in a fashion that will be acceptable to their modern, hip audience. For an example of someone who is truly doing something very different with multimedia today - see Dai Sugano's work at the San Jose Mercury News: http://www.mercurynewsphoto.com/blog/2007/12/23/uprooted/ Like it or not - it's different, original, and engaging - and while some may thank that it may not be appropriate for all news outlets, the truth is that he has a strong following of his work and he has built up his own loyal following - and that's what the web is all about. Of course you can always look to Brian Storm's team at http://mediastorm.org to produce some of the strongest content out there - they have also begun a series of multimedia workshops that I hear are excellent. As some of you may know, I left my staff job at The New York Times a little over two years ago. At the time many people were shocked. One colleague actually called me "stupid." I saw some of the writing on the wall back then - I saw all of these different forces converging down on the mainstream media and thought it was time for me to diversify. If found a way to continue to work with the newspaper and its staff that I love by going on contract with them, and that in turn allowed me to do some commercial work, to work with companies such as Apple and Canon in helping them develop new software and cool toys, and work on a number of other projects. What it allowed me to do was to DIVERSIFY - which I think is key to survival in this market. At the time people thought I was reckless for leaving such a coveted staff job. The NYT job was a union job - with incredible benefits, a staff car, and company gear and it was often described as a "guaranteed job for life." Unless you committed a felony, or broke an important ethical rule, "they can't fire you," I was repeatedly told. A few weeks ago I was at The Times to judge the Sports Shooter Student Portfolio of the Year and when I came out there was a strange feel around the newsroom. That day was the day that The New York Times was having it's first layoffs in the newspaper's history, that's right until then, there had never been a single layoff at The New York Times. People were being called in the editors' offices and being told they were being let go - this after not enough people had opted to take a series of buyouts. This was fundamental change in what we were taught to believe in - what ever happened to that "job for life." Well that dream, that comfortable "cloud" and the idea of a staff job, is becoming a distant memory these days - no one is immune - not even The NY Times. Because it's so important, let me mention it again: I think that diversification is the trick to long-term survival in this new market. For me these days, editorial works ebbs and flows, as does the commercial work. When I mix other projects into the mix - suddenly I don't stress out when one part of my business is slow - because another is usually busy. 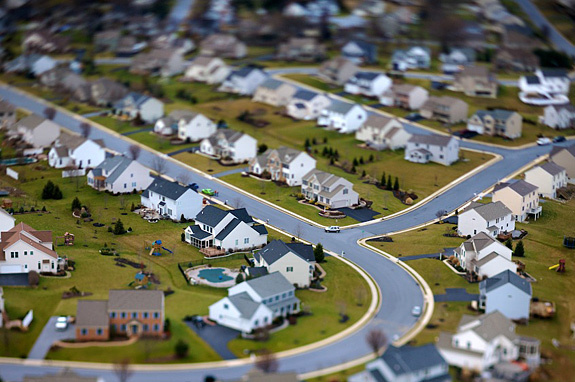 An aerial view of Southridge Farms, a suburb of Lancaster County, PA. The most important thing that happened to me as a result of leaving my staff job was for me to remove the blinders that I think most photojournalists have on these days. We're so focused and passionate about what we do that we often don't see how much opportunity there is in the world of photography - outside of photojournalism. From fine art photography to commercial work, these disciplines are so different then the little cocoon we're used to being part of. And then eventually I started to realize how much more there really was out there in the real world: There is so much out there for us to explore creatively. From video, to film, to 3D Computer Generate Images and animation, motion graphics, to creating complex music on a laptop without a single physical musical instrument - you name it. Never has there been more opportunity to expand one's vision and creativity. Software and hardware suites that use to cost $250,000 are now available for less than $500 and usually run on a $1,100 MacBook. I'll leave you with this. If I were 22-years old right out of college looking for a job or a career path, I wouldn't be focusing on working on x newspaper to get to y newspaper and then eventually z magazine with my 20 image portfolio that contains 2 spot news photos, 4 sports pix, 4 feature photos, and a 10 picture story. That model is dead - to put it bluntly. I'd be thinking big - realizing that I have a chance to be a pioneer in this new world of opportunity. Trying to think up of the next big thing. The next best way that photography and visual journalism can be shared with others and a way of packaging it and delivering it that has yet to exist. I'd be excited. Perhaps I'd consider creating my own web publication, and finding news ways to promote it and to generate income - as opposed to relying on the media giants that rely on the "old world business models" and rights-grabbing contracts. Because the future has never been this wide open and it has never been this easy to reach out to your audience. Remember that the single biggest expense for each magazine issue is still the cost of printing the magazine - it trumps the entire editorial production costs. If you harness the power of the web you've cut out the single biggest expense and are far, far ahead of these media giants. The World Wide Web is your oyster. Some of you may find the next "mySpace" idea and become billionaires, other will think long and hard on how they can help their newsrooms lead the way with new ideas and innovation during the tough economic times ahead - your youth may be a liability in the newsroom due to your lack of experience - but it is also the secret to you potentially becoming one of their most productive and influential members because of how much more in touch you are with the latest trends. The challenge is to find a way to continue to produce quality original content, and to connect with your audience - not to hold on to the old, traditional way of doing things. So while the cloud may be falling - there's plenty of blue sky above - and the possibilities are endless. Good luck. Also, I'm kicking around the idea of putting some seminars together with a variety of top industry professionals, photographers, editors, advertisers, designers, that are ahead of the curve in terms of technology and new ideas, to discuss a lot of the issues I mention above please shoot me an e-mail to the address above if you think that's something that might be of interest to you this will allow me to gauge interest there as well and let you know if it's going to happen. Thanks!